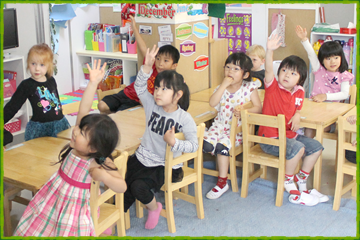 At the beginning of K4, children will adjust to new teachers, a new classroom and a new routine. The self confidence that the children bring with them from K3 will be used as a foundation on which to further build. 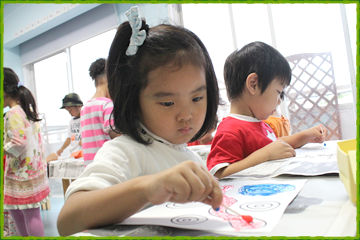 The children will come ready to take an active interest in learning and be ready to explore new things. We will be helping the children stay motivated especially when dealing with challenging assignments. We will also show the kids that they can indeed improve on things that they may not yet be good at. Letter names and sounds will be reviewed at the beginning of the year to make sure that all children have a working knowledge of the alphabet and phonics. By this time of the year children will interact comfortably with their friends during both work and play. They are becoming independent learners, and we see them complete tasks with intent and focus. The children will be able to complete more complex tasks and they will be expected to exercise more self-discipline. They will be able to do things like pay undivided attention, resist distractions and complete work on time. The children’s enthusiasm will be harnessed for active participation in the classroom and for accomplishing assignments relative to each child’s own aptitude for that discipline. 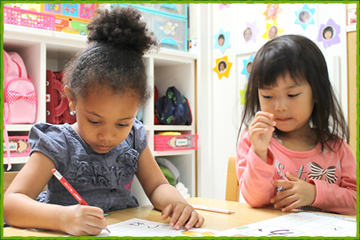 For literacy readiness, we emphasize things like phonetic awareness, sentence word counts, rhymes, syllables, and help the kids identify beginning consonants in words. By the end of K4 kids will have lots of practical experience in dealing with simple mathematical equations. The children will have a solid phonetic foundation upon which to further build their basic reading skills. As the kids further master skills they enjoy having their voices heard. They will be able to tell stories before the class in their own words. The kids will be able to deal with their own issues too and find solutions if they have conflicts with other kids. Teachers will mediate but by this stage may not need to directly intervene. The children will be adaptable and flexible. They will be ready for the next step in their schooling.